Wildflower meadows in Garry Oak woodlands were once extensive on southeastern Vancouver Island, but now only tiny fragments remain, surrounded by urban and suburban development. Douglas Leighton. 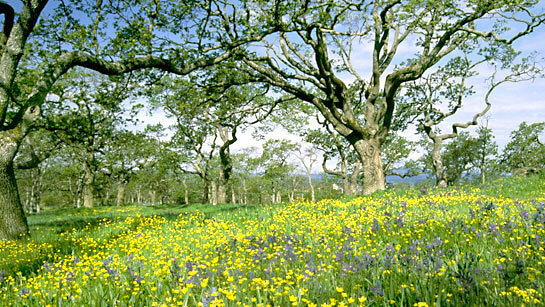 Native meadow habitats dotted with groves of Garry Oak trees were once a significant feature of southeastern Vancouver Island and the Gulf Islands of the southern Strait of Georgia. But most are now gone. This ecosystem is endangered not only in British Columbia, but it is also disappearing under the tide of development in the Puget Sound region of Washington State and from the lowlands of Oregon, the only other places it occurs. The city of Victoria prides itself on its old English style, and its winding streets lined with large, stately Garry Oaks lend a distinctively English feel to the city. But these veteran trees are also sad reminders of an ecosystem that has been virtually exterminated. The wildflower meadows, shrublands, and the groves of young oaks and crabapples that once accompanied the big trees have now almost all vanished. One by one the old trees fall or are cut; few young trees spring up in their place. 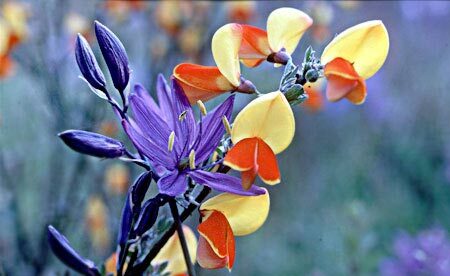 Scotch Broom, an invasive, introduced plant, has attractive yellow, or sometimes yellow and red, flowers. Here it grows with the native, blue-flowered, Common Camas. Robert Cannings. The few small tracts where the woodlands have not been developed have been invaded and choked by introduced Scotch Broom, Gorse and a multitude of other foreign plants. Most of the meadows were grazed extensively by sheep, goats or cattle over the years, and this history has also taken its toll on the native flora.